We're back for round 47 of Wardrobe Wars! If you're unfamiliar with this contest, this is Wardrobe Wars, and we take submissions from you to be featured on the Wardrobe Hub! FEEDBACK WANTED: We're still trialling the use of Google forms for entry submissions, so please let us know how it goes in the comments below! We're very excited to announced that you may now generate an HTML version of your wishlist to post onto your Petpage on Neopets. You can find the "Petpage Code" functionality on the main wishlists page, down at the bottom by the Import and Create buttons. In addition, you have access to generate code for each individual wishlist in the "Manage" navigation when managing each wishlist. This feature is still new and in testing, so if you have any feedback (or run into any bugs), please let us know. 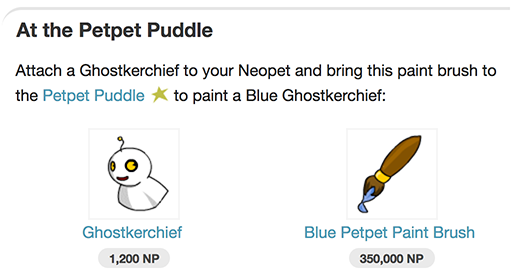 You may have noticed that all petpets in the database now have an "At the Petpet Puddle" section on their item details pages. The purpose of these sections is to tell you how to obtain that petpet at the Petpet Puddle—or to tell you it's not paintable at the Puddle. You can now add contact information for any type of list. It does not have to be Neocash related. We closed a few loopholes that allowed users to mark their list as having contact information, when we didn't have a username to provide. We also now hide lists that do not contain contact information from each UFT/Seeking page for Neocash items. We've added a new negg-themed guide to our database that highlights the current values of the neggs you may trade in. We take it one step further as well by calculating the "cost per Negg Point" and then sort them by the cheapest values, showing you which neggs currently give you the most bang for your Neopoint. You can find the guide under the "Content" dropdown menu in the Item Database. In addition to the negg value guide above, we've also added a Neggery purchase guide that highlights the current market values of the neggs you may purchase at the Neggery on Terror Mountain, compared to how much the current going rate for Negg Points are. Unsurprisingly, it's usually not worth trading in your Negg Points to redeem Neggs! Price Checkers: There's now a "Hide Images" option on all of our price checker tools. Gourmet Checklist: The Gourmet Foods Checklist Tool now has the option to filter results by which food shop it comes from. Wishlists: There is now a "check all" checkbox for the remove and obtained columns on the Manage Items pages. Wishlists: We also added the option for you to delete all of the items from a list at once, but keep the list itself. Find the "Delete All" function at the bottom of the Manage Items page. 1/21/2017: Wishlist Import tool, Neodeck images, and printable search results! 1/11/2017: Neocash Seeking/UFT Lists and Printable Wishlists. 10/23/2016: Create wishlist with checklist tool results, Boring/Yuck labels on the Book/Booktastic/Gourmet checklist tools, TCG set categories, Cooking Pot Recipe sections, Price Checker tools, Neocash special categories, Petpet Matcher, and NC Trade Finder. To a computer near you. Wardrobe Wars - Round 46 Results! The results of the latest Wardrobe Wars competition are finally here! Did your entry make it on to our Wardrobe Hub? Winners, keep an eye on your cabinets as you'll be receiving the new Wardrobe Wars Champion! trophy in the next few days! We'll be back in June with the next round! We're back for round 46 of Wardrobe Wars! If you're unfamiliar with this contest, this is Wardrobe Wars, and we take submissions from you to be featured on the Wardrobe Hub! This month's theme is Neopia World Tour: Brightvale, so get your books and quills ready! Wardrobe Wars - Round 45 Results! The results of the latest Wardrobe Wars competition are finally here! Did your entry make it on to our Wardrobe Hub? Winners, keep an eye on your cabinets as you'll be receiving the new Wardrobe Wars Champion! trophy in the next few days! We'll be back in May with the next round! This page was last updated on December 16, 2011.